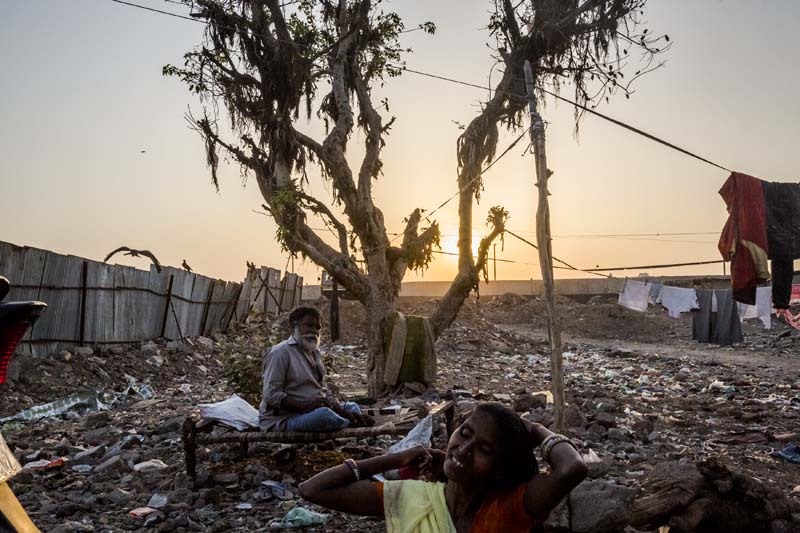 AHMEDABAD, GUJARAT, INDIA - APRIL 11, 2014: Residents, awaiting their relocation from the neighborhood, stand in the slum of Jamalpur on April 11, 2014 in Ahmedabad, India. The project, developed by the Sabarmati River Front Development Corporation Limited (SRFDCL) is funded by central government of India and was charged with the responsibility of developing the approximately 10.4 km stretch along the river in the city. The project has encountered several delays due to concerns regarding water level, flooding, rehabilitation of displaced slum dwellers and met with severe opposition from activists involved with slum rehabilitation. However, the process of obtaining land for the development, through clearance and reclamation has been substantially completed. Narendra Modi, leader of the Bharatiya Janata Party, won a landslide victory in India's 2014 general elections, which took place between April 7 and May 12. With over 550 million votes cast, it was the largest election in history. It was the first time since 1984 that a party has won enough seats to govern without the support of other parties. Modi, the former governor of Gujarat State, led his party to defeat the Indian National Congress party, which has led the central government for a total of 49 years since the country's 1947 Independence. In the run up to the election, with India's economy faltering and the government plagued by corruption scandals, BJP were able to position itself as the party of the urban middle class, an increasing constituency as more Indians move from the countryside to cities and those cities, in turn, become more prosperous.